Experience a new level of clean with the Soniclean VTplus upright vacuum cleaner, the first and only vacuum cleaner to use sonic cleaning technology. The Soniclean VTplus features a patented sonic bar located behind the brush roll that produces 200 vibrations per second of sonic cleaning power to help dislodge the deep embedded dirt in your carpet. Soniclean also has a hard floor setting and works exceptionally well on all hard floor types. The Soniclean VTplus includes Sonicfresh; a fragrance dispensing system that releases a light refreshing scent of fresh folded laundry to keep your Soniclean smelling fresh and clean. The patented SEAL-TECH HEPA filter bag system is designed to capture allergens and microscopic particles. This cleaning-obsessed lady is pleased! I absolutely love this vacuum! Cons first: it's pretty loud. Like old-school Hoover, back-in-the-day kind of loud. This is because of the additional vibrating plate on the bottom which vibrates to shake up more dust. Deep clean worth the extra noise? I think so... Ok, the good stuff: My parents also just bought a new vacuum (NOT the VT Plus) which we have named "The Robot" because of all of its bells and whistles. If you like all the fancy extras like that, this vacuum may not be for you. But if you like a simple, very effective vacuum, you can trust this one to get the job done. It doesn't have all of the hoses and tubes and whatnot, which greatly reduces bulk, and improves maneuverability in my opinion. The hand vacuum that this came with was perfect for the little details like baseboards and hard to reach places, but the VT Plus itself is way more retro than that. It has one switch with two settings: bare floor and carpet, and it cleans them well. I have been nothing but pleased. Have bought 2. This is a GREAT vacuum! Got one for us and one for my daughter. My wife loves the scent pods. 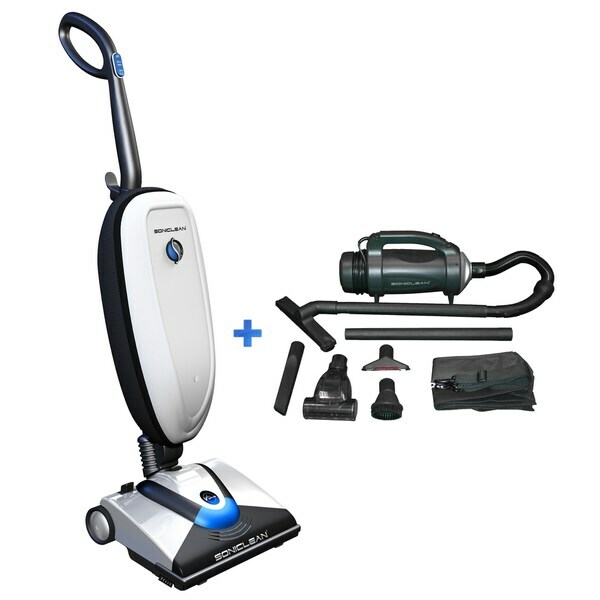 It is lightweight and easy to use, very powerful, and the does not throw any dust into the room. My vacuum was broken by the motor & belt. It compared as Oreck and Hoover. I trust the Soniclean product and it was an excellent price especially with the Handheld Vacuum addition.